I put in 2 more hours of digging, stacking, and packing at 122 after work this evening. After 2 days of rain the soil was nice and damp and the berm and first roller set I built on Saturday were pretty solid. It's a slow and steady process working solo, but the final product will be kick a$$! 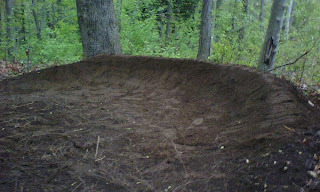 Here is a camera phone photo of the first berm taking shape. Speaking of trails...T took a nasty digger as a result of going full speed into a freshly made, lightly packed berm at Schmidt's Trails. 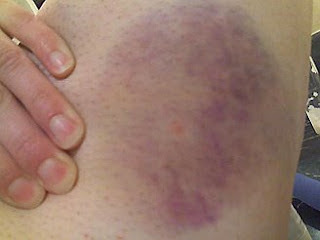 Check out this bruise on her thigh...gnarly!! !